20 km west of Waibakul is Waikabubak, situated 400 meters on a plateau and with a pleasant climate. 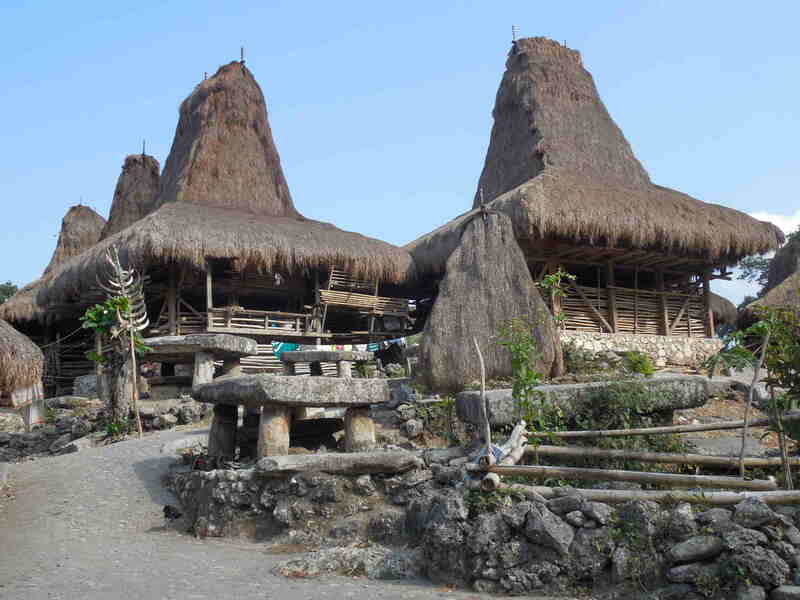 The town is a good starting point for exploring nearby traditional villages and attractions in Central and West Sumba. The centre is tiny and has only a few longitudinal and cross streets. In the evening water buffaloes and horses are driven through the town and at the central crossing soccer is played. The 2 and solar-powered traffic lights stop working soon after sunset. The town also has a tourist office. The employees are well informed about what's happening in town and its immediate surroundings. It is at the extension of Jalan Veteran in the vicinity of hotel Artha. Nearly on every wooded hill in town and around there are traditional villages. To explore them you need no guide. - One village north of Jalan Veteran, in sight of Artha Hotel. Seventeen villages are located east of Jalan Gajah Mada and south of the road to Waingapu. These include Kampung Elu, Praiijing, Gollu, Bondomarotto, Prairami and Primkateti. All are within walking distance; the farthest is 4 km away from town. A little further away, up to 12 Km north of the town and less often visited, are many other villages, including Kampung Ratuwanu, Tambera and Gelukoko. A hike to traditional villages east of Waikabubak can be combined with a subsequent descent to the river delta of Wanokaka. For that you start east of Jalan Gajah Mada then hike from village to village eastwards. After about 3 km (as the crow flies) you come to a small road which is slowly curving down to the south and ends after 10 km at the Wanokaka Waikabubak road. On the way back you take a Bemo. Alternatively, a circular route with views of Wanokaka and back to Waikabubak is possible. Alternatively you can go down to Lai Popu waterfall (cf. below) and try to get a hike back. Another hike leads towards Lamboya. It begins in Weekarou, south of Waikabubak along the government buildings. From there, it just goes straight on, initially along the edge of the plateau and then all the time downhill. On the way you have great views of the rice terraces on the hillside. Some traditional villages are on the way and at the end you come to the (unfortunately almost completely burnt down) traditional village Sodan (Sodana). Then you need to climb up 100 meters to Kabukarudi. There you take a Bemo back. Overall this is 17 km. West of Waikabubak offers 2 tours: Go by Bemo 10 km up to the sign Waikelo Sawah. In southern direction here is a small waterfall which comes out of a cave. Later down the road there is a great view of irrigated rice fields on the plateau. Or go by Bemo 13 km up to the sign Loko Winne. South of the road you reach interesting grave fields. At the slopes of the hills, around the graves are several traditional villages. Particularly noteworthy is the original Marapu village of Weelewo (Weeleo). You have to walk there and back, but you can combine the 2 destinations by walking south of the main road from one destination to the other. It is difficult to get lost here, the area is densely populated.